The estimated 2014-15 corn crop is slated to be record large at 13.935 billion bushels, up slightly from last year’s 13.925, according to USDA’s latest World Agricultural Supply and Demand Estimates (WASDE). With decent weather, soybean production, too, will bust bins at a record 3.635 billion bushels, according to the estimates. Still, both corn and soybean prices will be substantially lower than the past several years. For corn, higher expected yields this year will offset a reduction in planted area, says USDA. The department expects the U.S. average corn yield to come in at 165.3 bushels per acre, up 6.5 bushels from last year. The forecast assumes normal mid-May planting progress and summer weather. 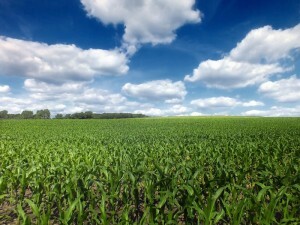 “USDA is using a really large yield for corn, and they haven’t added in any more acres, says Peter Georgantones, analyst with Roy E. Abbott Futures in Minneapolis. He was the commentator on the post-report MGEX press call. Georgantones expects USDA to eventually add another 1 million to 2 million acres of corn plantings to the 2014-15 balance sheet. “If any troubles in corn cause USDA to take 10 bushels off the yield estimate, there could be tightness in the corn market pretty quickly,” says Georgantones. Corn supplies for 2014-15 are projected at a record 15.1 billion bushels, which is 330 million more than last year. USDA expects U.S. corn use to drop 2% below a year earlier. With animal numbers smaller than a year ago, feed and residual use is projected to be 50 million bushels lower than last year. Corn exports are expected to be 200 million bushels lower than current-year exports as world supplies grow and demand softens. Corn used to produce ethanol is expected to be unchanged from this year. Lower demand and higher production leaves the 2014-15 estimated corn ending stocks at 1.7 billion bushels, up 580 million bushels from the projection for 2013-14. The larger carryout is expected to pressure the farm price to $3.85 to $4.55 per bushel, down from $4.50 to $4.80 for old-crop. Soybean production is also projected to be a record 3.635 billion bushels, up 346 million from the 2013-15 crop. USDA estimates that the average U.S. soybean yield will be a record 45.2 bushels per acre, or 1.9 bushels higher than last year. Total 2014-15 soybean supplies are projected at 3.78 billion bushels, up 7.4% from last year. The U.S. new-crop soybean crush is projected at 1.715 billion bushels, a 20-million bushel increase over last year, reflecting increased domestic soybean meal consumption. Increased supplies and lower prices, however, will not help U.S. soybean meal exports as Argentina fills most of the world’s import demand. U.S. soybean exports, however, should remain robust at an expected 1.625 billion bushels, 25 million bushels more than this year due to record supplies and competitive prices. Despite such strong demand, new-crop ending stocks are projected at 330 million bushels, or 200 million more than old-crop ending stocks. That will put the stocks-to-use ratio to 9.6%. The U.S. average new-crop soybean price is forecast to decline to $9.75 to $11.75 per bushel compared with $13.10 per bushel for old-crop beans. New-crop soybean meal prices are forecast at $355 to $395 per ton, compared with $485 per ton for old crop.